The Superpowers is a 10-piece, 21st Century Dance Band. 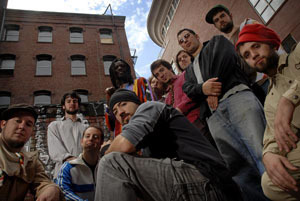 In June 2007, with the release of its debut album, REVIVAL TIME, the band formally known as the Boston Afrobeat Society shed its Afrobeat cocoon and moved forward with a NEW agenda – creating a Community wherein people across the planet can unite in collective energy and dance to create positive social change! Voted Best World Act in the Phoenix 2007 Best Music Poll and 2006 Boston Music Awards, The Superpowers have been hailed by critics as a "poly-rhythmic juggernaut", They have played packed houses throughout the Eastern U.S. and shared the stage with internationally renowned artists including Sierra Leone’s Refugee All-Stars, John Brown’s Body, Aphrodesia, NOMO and Audible Mainframe. In the past year they’ve played nearly 100 shows at festivals, bars, clubs, farms, and community events, rallying to end the violence in Darfur, raising money for development projects in Zambia’s Meheba refugee settlement and supporting Fair Trade in South America. The Superpowers also forged a partnership with Boston’s Green Grease Monkeys, and tour with vehicles running on WVO or Waste Veggie Oil – No Gasoline! The Superpowers play every month at Zebulon Café in Brooklyn, Matt Murphy’s Pub in Boston, and Tazza Café in Providence. Look for them on tour this summer in support of their first full-length record, REVIVAL TIME! Members of the Superpowers can also be seen around the Northeast performing with Amayo's Fu-Arkestra, Kings Highway, BQEZ, Dead Cat Bounce, Depth Quartet, and Samba Lolo and are current and former students of numerous internationally renowned musicians including Danilo Perez, Rakalam Bob Moses, Robin Eubanks, Bob Brookmeyer, Dave Holland, Jerry Leake, Michael Cain, George Garzone, Cecil McBee, and Ran Blake.